It only took 2 weeks of planning and virtual decision-making (and heckling each other! 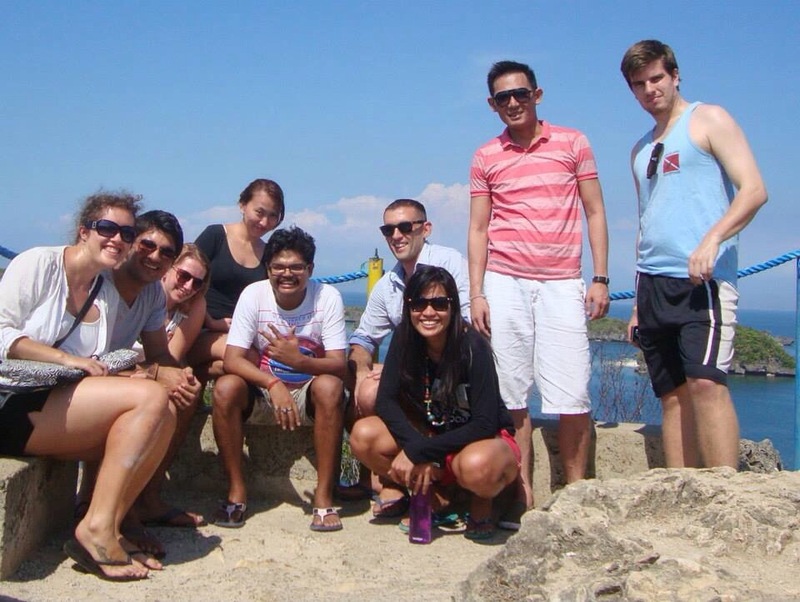 Haha) before the 100 Islands Extravaganza (coined by Matt) weekend escape came to be! And mind you, not everybody knew each other before this trip. Some, we only met on the day of being Alaminos-bound itself! Logistics Tip 1: Buses tend to get full so unless you want to sit along the aisle with a small children’s seat, be there at least an hour early. No joke. Budget Tip 1: If you are a student, bring your ID to avail of the 20% discount. Non-aircon buses are also cheaper. So choose that or AC bus, depending on your comfort or tolerance level. Here’s the list of prices of services or fees you could avail for your Hundred Islands Tour. ENTRANCE FEE (PHP): – Day Tour – 40.00 – Overnight – 80.00 Note: – Children 5 years old and below are free of charge and 20% discount for the Senior Citizen. – Likewise, in conformity with the Tourism Code, ENTRANCE FEE will be known as ENVIRONMENTAL FEE. MOTORBOAT RATES: SMALL (good for 5 persons) – Day Tour – 800.00 – Overnight – 1,400.00 – Day Tour Service Boat – 1,400.00 MEDIUM (good for 10 persons) – Day Tour – 1000.00 – Overnight – 1,800.00 – Day Tour Service Boat – 1,800.00 LARGE (good for 15 persons) – Day Tour – 1,100.00 – Overnight – 2,000.00 – Day Tour Service Boat – 2,000.00 Note: Day Tour covers islands hopping limited to three islands including: Quezon Island, Governor’s Island and Children’s Island. 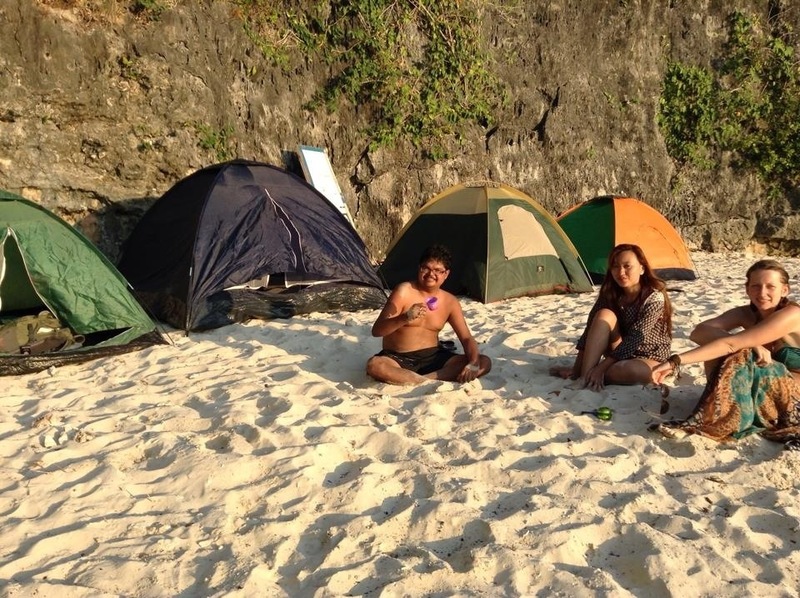 Logistics Tip 3: Overnight rates apply only if you will camp at the developed islands namely Governor’s Island, Children’s Island, and Quezon Island. If you wish to camp at an undeveloped island (like we did), you would have to pay for another Day Tour boat that will pick you up. We paid for two boats and we got to pass by Marcos Island for cliff diving on our way back to mainland. Budget Tip 2: The fare from the Victory Bus terminal to Lucap Wharf or the Hundred Islands Tourism Office is P60 per tricycle. Confirm this before boarding the trike. The public market and Nepo Mart, as well as the Mart One supermarket, are walking distance from the bus terminal. You can do your shopping first and take the trike afterwards. Otherwise, the trikes will tell you it’s P100, including the waiting time. Budget Tip 3: Bring utensils as well as cooking equipment if you can. The P1000 package for gas tank, cooking range, knife, bowls, spoons and forks (about 5-6 sets) was a robbery to me. 🙂 Plus, the tour arranger insisted that it’s a package, which means it’s either you get it or you don’t. If you plan to get it, no need to buy extra eating utensils unless the sets provided is not enough for your group. Kapil found a purple teacup! While it’s cute and all, please make sure to not leave your trash lying around in the islands. Let’s do our part to maintain its beauty! After pitching our tents at Scout Island (we got lucky that there was no marshal to charge us P200/tent, which is automatic when you camp at the developed islands), the next order of business is — do nothing! 🙂 Well, actually, we did go for a swim and made sure we have collected enough wood for the small bonfire (note: unless you know how to make one and to put it off after, PLEASE DO NOT start a bonfire. Also, please use fallen wood and twigs) we’d be using to grill the corn and to warm us in the night. Matt prepared home-made tortillas while in Baguio and we chopped and diced the potato (which will be the main filling), tomatoes, onions and cilantro (I think ) for the salsa to go with it. It was yummy! 🙂 We also grilled the corn by the camp fire. Lifehack Tip 1: There’s no need to buy BBQ sticks for the corn cob since the small branches and twigs will do the job for you anyway! Lifehack Tip 2: You can use leftover (for the salsa) calamansi (local lime) and salt to add flavor to the corn. And if you have tequila, yes for that one too! Logistics Tip 4: Have enough food and water (and alcohol) that will last you for the time that you are camped in the island. Buy stuff that don’t need cold storage (unless you avail of the ice chest package or brought one yourself) and which does not go bad easily. Eggs, bread, pancakes, fruits, chips, milk (carton, not opened till morning), coffee, salt and sugar practically filled our supply cart. 3. Snorkel till you drop The boatman will bring you somewhere in the middle of Lopez and Quezon Island. There will be a platform for those who want to jump into the clear waters and play with the fish. While it’s not as diverse as other snorkeling sites (like in Bohol), there certainly are a lot of fish in the sea! I did not see Nemo though! Both ends of Scout Island also had areas for snorkeling. If you are on the island and you can swim (or if you have a life vest), you can go to the right side and enjoy some more marine life. Otherwise, the area on the left by the rocks would also have small fish you can play with. Lifehack Tip 3: If you have a piece of bread, hold it in your hands and the fish will swarm towards you in a moment. I have always loved the sunset, especially when I’m at the beach or up in the air. And, the sunsets in northwestern Philippines are among the best I have seen. So even though we were busy playing around or making the food, we still made sure to take a pause and enjoy the magnificence of nature in front of us. We also saw the stars and constellations that night, since the only light we have is from the camp fire and the stars above — so unlike the brightness of Metro Manila. 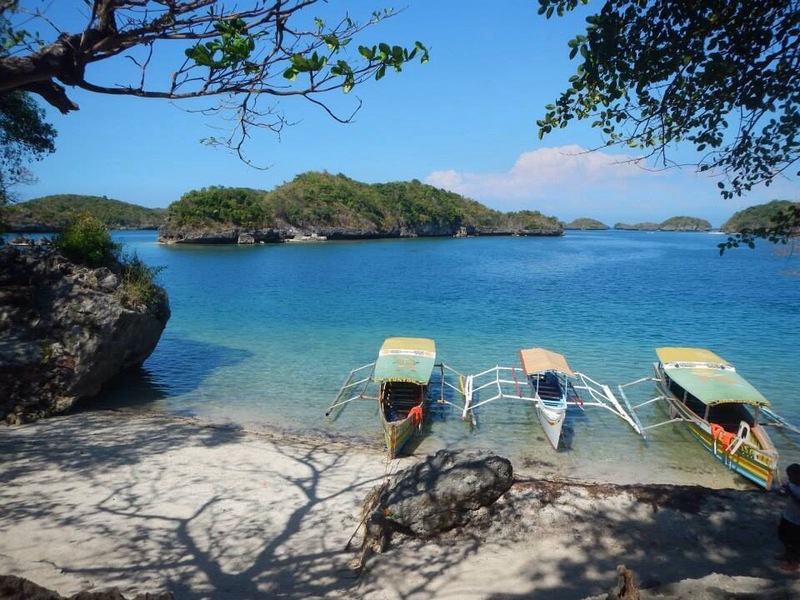 And, perhaps as a bonus to us, we didn’t know that Hundred Islands had those “magical plankton” that illuminate the sand and the sea at night. Imagine Avatar the movie or Life of Pi. With every step, with every wave, the sea and the sand lit up. I’d need to update my CS profile and add it as one of the most amazing things I’ve seen in my life! I have gone cliff diving before inside the cave in Sagada, by the Bomod-ok waterfalls also in Sagada, and at the Ulot River in Paranas, Samar (you should go and do the torpedo boat ride there by the way — it’s awesome!) all in 2013. 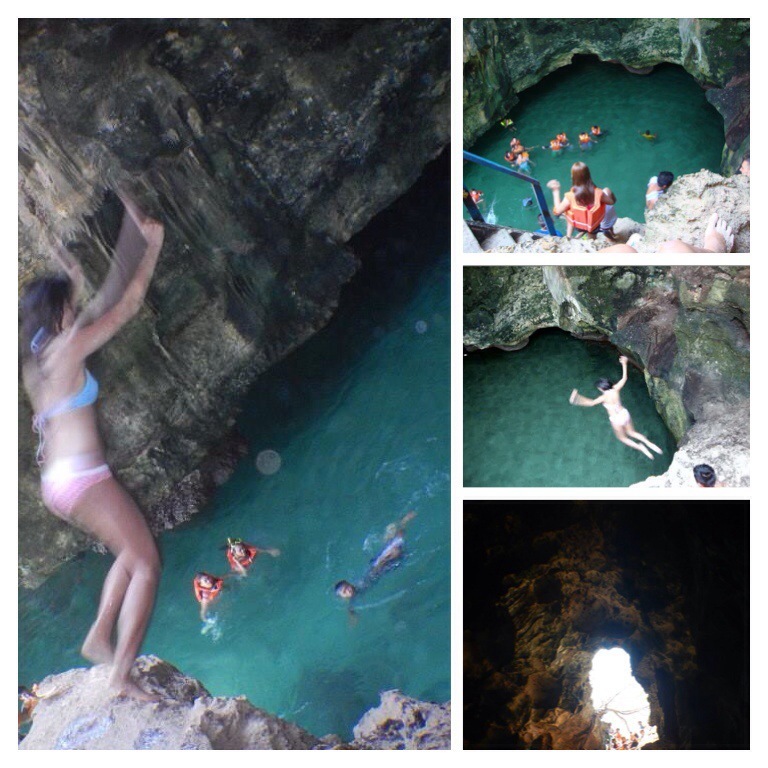 This is my first cliff dive of the year and yes, I am looking forward to more in 2014! 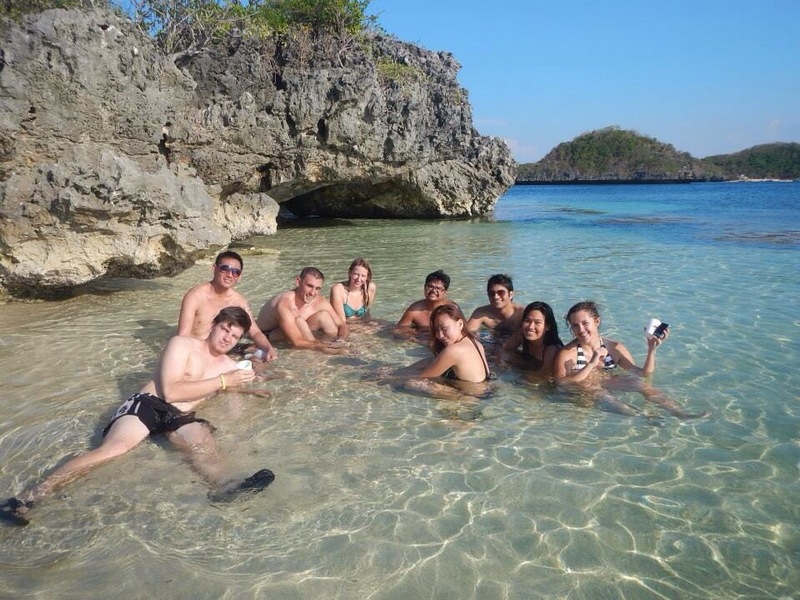 There probably are other things you can still do while the Hundred Islands National Park. I guess it will depend on who you’re traveling with. Like, Children’s Island will be good for families with kids (no joke) since the water is shallow, Quezon Island I suppose would be good for those who want to have a bed and proper toilet and bath facilities. For the rest of the urban jungle backpacking community though, we all know that we can sacrifice some comforts to get the most out of our money and the time we managed to steal away from work. For a quick calculation, I think each of us spent on average between P1500-1700, all-in, for the weekend at the Hundred Islands — not bad, huh?! hey nice post. we are planning to visit the islands this dec. may i know what camera did you use for the underwater pics? Nice. Me and my friends are planning for last trip this midyear break. 2nd week of July… And your site help a lot. Ty. Yey! Enjoy your trip! Happy wandering! Hi! How many days/nights did you spend there? Thanks! hi! may i know if undeveloped island have their cr/toilet. also is there a means of clean water that can be use for cooking? thanks! Hi Kimberly! Sorry for the super late reply. When we were there, the toilet is the wilderness. Not the best option and not the most mother earth friendly. We brought our own water for drinking and cooking. But it has been two years so maybe it has changed?